Do you see yourself as a supervisor, manager, director or dean some day? If you think leadership is in your future, you can start preparing yourself now by learning from successful leaders as they share the experiences they sought and the steps they took. The Library Leadership and Management Association (LLAMA) will present Moving into Leadership: Transitioning into a New Role, on Friday, February 9, 2018, from 10 a.m. to 4:00 p.m., in conjunction with the American Library Association’s Midwinter Meeting in Denver. This institute will feature a panel of eight experienced academic, public, and health sciences library leaders discussing how they prepared for their leadership roles, followed by facilitated tabletop discussions on a variety of leadership topics. - Identify what knowledge, experience, and competencies they need to develop in order to position themselves for a leadership role. - Have an opportunity for informal conversation with panelists and other participants. Attendees will increase their competence in several of LLAMA’s 14 foundational leadership competencies including communication skills, change management, collaboration and partnerships, problem solving, and evidence-based decision making. $145 for LLAMA Divisional Members; $195 for ALA members; $75 for Students and Retired Members; $295 for Non-Members. Register online at: http://2018.alamidwinter.org/registration/ticketed-events#LLAMA – this takes you to “Ticketed Events” on the ALA Annual site; then search for LLAMA Institute (Event Code: LLA2). *Includes workshop materials and lunch. Pre-registration is recommended; on-site registration is subject to availability. The LLAMA Career Institute is open to all. Introduced at the 2013 ALA Midwinter Meeting, the LLAMA Career Institute is a continuing education offering aimed at early-career professionals and professionals at any career stage seeking to acquire new knowledge, skills, and competencies in support of active and ongoing career development or potential career changes. The MLA Medical Informatics Section (MIS) awards up to $1,500 to support a career development activity that will contribute to the advancement of the field of medical informatics. If you’ve been wanting to take a course or attend a conference related to medical informatics but haven’t had the funds, then this is an opportunity worth exploring! MIS membership is a preferred qualification, so as a member you already have a step up on the competition! The deadline to apply is December 1, 2017. For further information or to apply, go to the grant information page at http://www.mlanet.org/p/cm/ld/fid=301. Just a reminder that the deadline for nominations for the Colaianni and Broadman awards are due November 1, 2017. See blog posts below for more details. Are you aware of a librarian who has engaged with the local, state, or federal government to encourage improved health? The Carla J. Funk Governmental Relations Award recognizes a medical librarian who has demonstrated outstanding leadership in the area of governmental relations at the local, state, or federal level, and who has furthered the goal of providing quality information for improved health. Named in honor of Carla J. Funk, Executive Director (1992-2015) of the Medical Library Association, who worked diligently and passionately to provide visibility for the association and profession, and to further the association’s governmental relations agenda, the award was established in 2008 through a contribution from Kent Smith, FMLA. The recipient receives a certificate and a cash award of $500. Nominees must be current members of MLA, and have been a MLA member at the time the governmental relations activities occurred. Self-nominations are welcome. More information and the nomination form can be found at http://www.mlanet.org/p/cm/ld/ fid=247. Nominations are due by November 1, 2017, 11:59PM (CT). Questions may be directed to Jury Chair, Wendy Herman (saori.w.yoshioka@gmail.com). The deadline for submissions for the November issue of the Express is Friday, November 10. YOU are what makes the Express great, so please consider sending something in to share with your MCMLA colleagues. Please send in a blurb about your work! And don't forget to let me know about any papers, posters, presentations, awards, or any other recognition you or a fellow member have received, so we can recognize your efforts. Any of you who attended the annual meeting, please forward me your posters, papers, etc. if you would like them to appear in the Newsletter. We will feature them and have links to the content if you wish. Also consider writing up an account of something interesting you saw at the conference or forward any pictures you may want to share. These will also go into the MCMLA archives for posterity! You can email me at sprochia at health.missouri.edu with any questions. Nominate an Exceptional Hospital Librarian for the Colaianni Award! The Estelle Brodman Award recognizes an academic medical librarian at mid-career level who demonstrates significant achievement, the potential for leadership, and continuing excellence. Recipients receive a certificate at the MLA annual meeting and a cash award of $500 following the meeting. The nominee must be in “mid-career” at the time of the award, defined as someone working at least 5 years and not more than 15 years in an academic health sciences library; the nominee may not be a library director. For details and a nomination form, see Estelle Brodman Award. The deadline for nominations is Wednesday, November 1st (11:59 CT). Thank you. We hope to see a lot of applications. Fun stuff to do at MCMLA 2017! Check out some of these great events if you have time! Sunrise Seminar at MCMLA 2017! 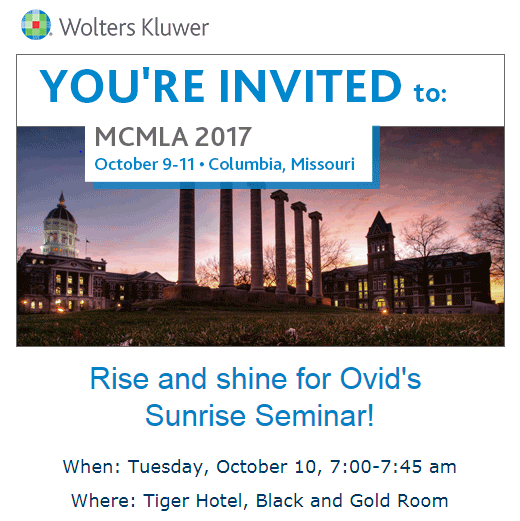 Our friends at Wolters Kluwer will present a sunrise seminar on October 11, 2017 during the MCMLA 2017 annual meeting. Details here! Be sure to RSVP for this great opportunity.